The last three months of 2018 were was a shocker for discretionary retail stocks. 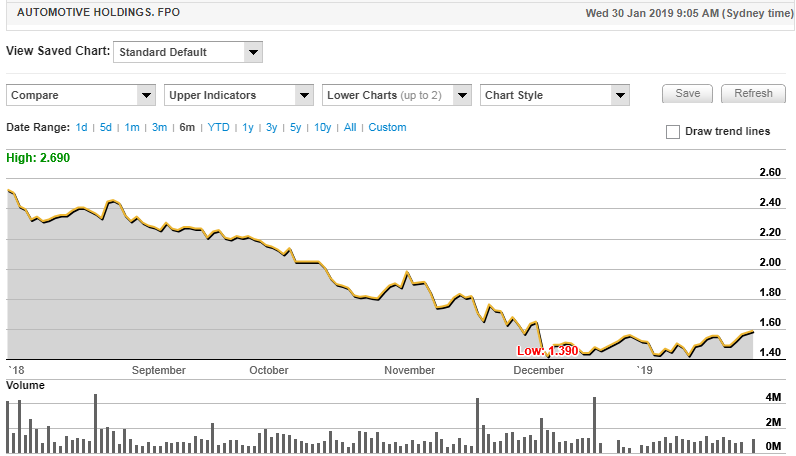 From September to December 2018 the S&P/ASX 200 Consumer Discretionary Index (ASX:XDJ) lost more than 20%, dropping from around 2600 points to a two-year low of 2021 in late December. The drop was brought on by slowing consumer spending and negative consumer sentiment and other key indicators such as declining house prices. The sell-off also coincided with a downturn in global equity markets, which then bounced back some in January. Consequently, it isn’t surprising to see support for the sector — the new year brought a 200 point rally in the index. The bargain hunters are well and truly back in the game, although there remains a definite knock on bricks and mortar retail stocks. One sector that really felt the brunt of the sell-off was the automotive retail industry. Panic appeared to set in when year-on-year monthly motor vehicle sales data trended negatively throughout 2018. However, in the scheme of things, the full-year decline in 2018 represented a modest retracement from three consecutive years of record levels achieved between 2015 and 2017 inclusive. As you can see in the following chart, 2018 car sales were broadly in line with the all-time record (at that stage) set in 2015. 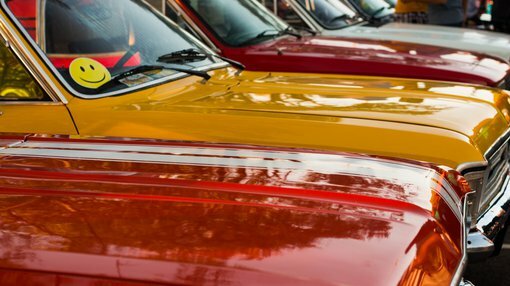 The most significant takeaway is that sales have declined from an extremely high level, and with this being the case, car retailers can still turn a tidy profit at current levels. 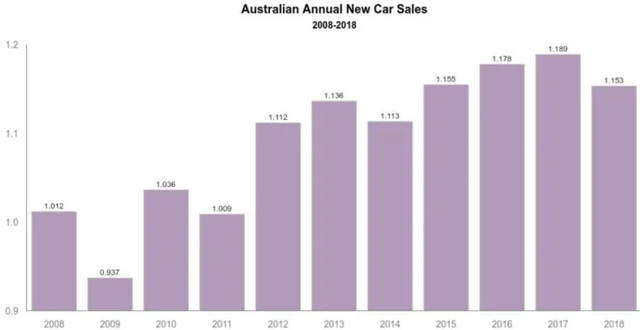 This was demonstrated by one of Australia’s leading car retailers in guidance released last week, which we will look at more closely a little later, as well as examining what this might mean for other players in the sector. Certainly, share price movements in the latter part of the week suggest that investors recognised the scope for better than expected performances from other players in the sector. Auto retailer, AP Eagers Ltd (ASX:APE) would have to be considered one of the most stable stocks in the industry, consistently outperforming expectations and maintaining a particularly robust balance sheet. Those who have held the stock over the last 10 years have seen the share price gain roughly 530%, and there hasn’t been a year go by during this period when the company hasn’t paid a strong dividend. However, even this track record wasn’t enough to insulate it from the sell-off as its shares plunged 35% between August and December. But the naysayers were set straight last week as management flagged a fiscal 2018 net profit of $101.2 million, up from $98.2 million in 2017. The pre-tax profit of $135.6 million exceeded management’s previous guidance which was in a range between $126 million and $130 million. As indicated below, the company has a record of consistently delivering profit growth. Even in the years that have been challenging, the year-on-year underperformance has for the best part been nominal. Under promising and outperforming has been a feature of the company under long serving managing director, Martin Ward. Ward made some interesting comments about both the company’s performance, divisional trends and the prevailing negative sentiment in saying, “The improved profit result compared to guidance has been delivered by stronger operating net profit before tax for both the car and truck retailing businesses. “Both businesses achieved record operating results for the month of December 2018, with the truck business also achieving a record operating net profit before tax for the 2018 financial year. AP Eagers provides investors with healthy diversification through its representation in all Australian states, excluding WA. As indicated below, the company also generates substantial income from the sale of used cars, a factor that could be significant if consumers tighten the purse strings. Since management updated guidance, the company’s shares have increased 10% from about $6.00 to $6.60. Based on these levels, it is trading on a forward PE multiple of approximately 13.5, suggesting there could still be some more room to run with the 12 month consensus price target sitting at $7.35. Analysts at Morgans said in November that AP Eagers was their preferred stock in the sector, and its 12 month price target of $7.94 may be more realistic, particularly given that the company expects to substantially exceed the broker’s net profit forecast at that time of $95.7 million. The share price retracement is good news for yield seeking investors as the consensus dividend of 36.8 cents should be met or exceeded. AP Eagers has traditionally split its interim and final dividend in a ratio of approximately 40/60 respectively. Having generated a profit broadly in line with the previous year, one would expect the fiscal 2018 final dividend to be in the vicinity of 22.5 cents. Based on consensus forecasts, a share price of $6.60 implies a yield of 5.6%, or 8.0% on a grossed up basis where shareholders can effectively employ franking credits. On the score of dividends, AP Eagers is a major shareholder in Automotive Holdings Group (ASX:AHG) with a stake of nearly 30%. AHG’s final dividend of 6.8 cents was well below the previous year’s dividend of 9.5 cents. While this will come into the mix when AP Eagers fleshes out the performance of its non-core operations and property transactions for the year, it doesn’t reflect negatively on the group’s operating profit. As AP Eagers had built up a company owned portfolio of prime position dealerships over 100 years of trading, management took advantage of these assets, selling them at premium prices and freeing up capital for investment in other areas of the company’s business such as acquisitions, an initiative that has been important in terms of broadening the group’s operations outside its home state of Queensland. AHG is the next company we profile, a group that has also been a growth by acquisition story. Automotive Holdings Group (ASX:AHG) is a diversified automotive retailing and logistics group with operations in every Australian mainland state and in New Zealand. Despite being Australia’s largest automotive retailer the company disappointed the market in November, providing fiscal 2019 net profit guidance in of $56 million to $59 million, more than 10% below its fiscal 2018 earnings. At that stage, the company’s shares had already fallen from a high of $3.87 early in the year to $1.85, but the profit announcement resulted in a further sell-off and a matter of weeks the company’s shares hit a nine year low of $1.39. However, as can be seen in the following six-month share price chart, this latest news has even been inspiring enough to generate some forward momentum with the company’s shares rallying about 8% in the last week. 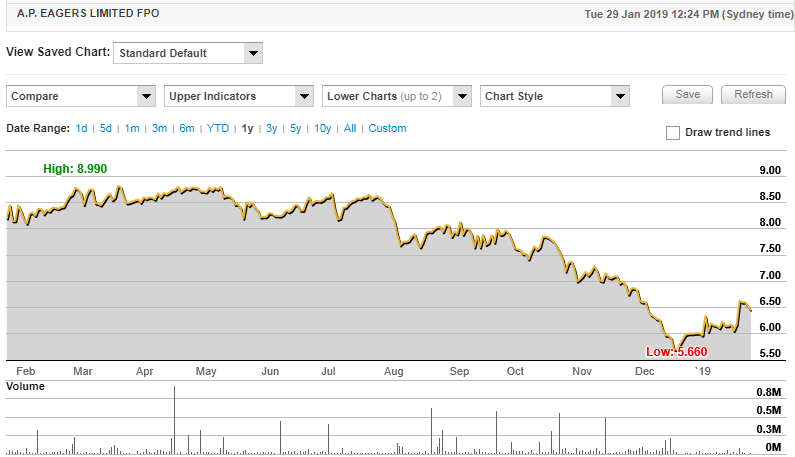 After the trading update, analysts at Morgans downgraded their price target from $2.05 to $1.83, implying upside of about 20% to the current price. However, the broker has reservations about the group, in particular its shift from ‘flex financing’ to ‘risk-based pricing’ given that the company generates significant income from the financing of motor vehicles sold. From a broader perspective, the broker said that vehicle financing was one of the biggest changes to impact the automotive retailing sector in a long time. Management is looking to leverage off its well-regarded brand to capture more of the used vehicle market, which it estimates has a value of $67 million. A significant part of management’s strategy is to improve its digital offering, reducing time and complexity for the consumer while increasing their control in terms of broadening buying options and adopting a ‘deliver anywhere’ approach. Management’s omni-channel investment platform, easyauto123, is aimed at making the company the first mover in bringing to market a truly digital product. AHG has invested heavily in this initiative over the last two years and if the company is able to achieve its breakeven target by the fourth quarter of 2019 that should be well received. The other avenue for potential outperformance is in the company’s refrigerated logistics division, an area that has historically placed a drag on earnings. However, in November management said that the division was delivering an improved performance following a recent transformation program, noting that it had a strong business development pipeline. Management has flagged a strong second half performance in fiscal 2019. 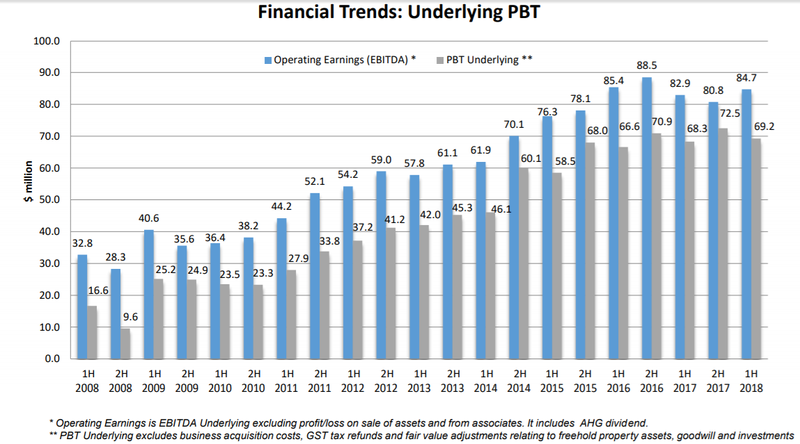 However, with the company trading on a PE multiple of approximately 10 at a time when earnings have turned sharply lower, it is likely that investors will take a wait-and-see approach, perhaps opting for AP Eagers at a multiple that is only slightly higher. Investors looking to ride the upside in the event of a recovery in the motor vehicle sector could benefit from examining the merits of MotorCycle Holdings Ltd (ASX:MTO). Motorcycle Holdings remains the market leader in motorcycle retailing in Australia with strong Original Equipment Manufacturer relationships and diversified revenue streams. In 2018, the company expanded its operating footprint across business units and geographically, particularly in relation to the east coast of Australia. 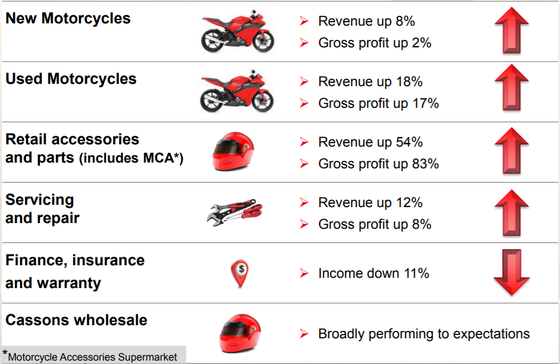 Similar to the other two motor vehicle companies we examined, MotorCycle Holdings also has a dominant market position in Australia where it is the largest motorcycle dealership operator. MotorCycle Holdings’ core business consists of the ownership and operation of motorcycle dealerships engaging in the sale of new motorcycles, used motorcycles, accessories and parts, finance, insurance and warranty, as well as service and repair. The following provides a snapshot of its business segment performances in fiscal 2018. The group also owns and operates a rider training school and a motorcycle repair business which performs smash repair work for insurers. MotorCycle Holdings represents a diverse portfolio of brands across the new bike segment with the company selling eight of the top 10 selling motorcycle brands in Australia by number of new motorcycle sales. In 2015, these eight brands represented 84% of Australian new motorcycle volume. In the used motorcycle category, the company sells all of the top 10 selling brands in Australia. While conditions in the motorcycle industry have also been challenging with sales coming off 8.7% in 2018, similar to the motor vehicle market, this decline is off high levels with 2016 sales the fifth highest in history. However, investors have failed to appreciate the relative nature of the decline as the company’s shares have been sold down from $4.80 to $1.70 in the last 12 months. It is worth the noting though that the company’s shares have rebounded since mid-January, no doubt assisted by AP Eagers profit update. 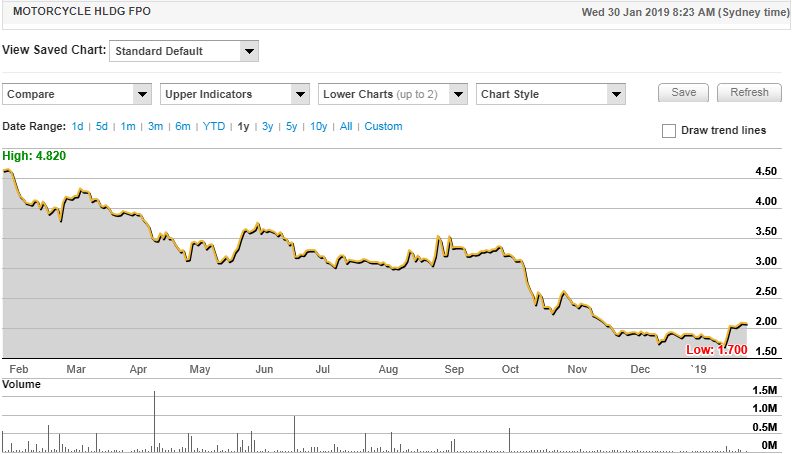 In the last two weeks they have increased 25% from $1.70 to $2.10, but there could be further upside given that Morgans’ price target was reset at $3.11 after the broker factored in difficult industry conditions in 2018. MotorCycle Holdings has been a growth by acquisition story, and by aggregating businesses under the one banner and adding efficiencies the company should be able to manage a tougher sales environment. One of the most significant acquisitions was Cassons which was purchased in October 2017. The $123.2 million acquisition strengthened the group’s wholesale and retail businesses. Cassons had a particularly strong position in retail where it sold motorcycle parts and accessories through eight outlets in New South Wales and Victoria under the Motorcycle Accessories Supermarket banner. The increased scale provides future opportunities to improve margins by sourcing additional Cassons products for retailing through the MotorCycle Holdings dealer network. Fiscal 2019 will be the first year in which the Cassons business entities have made a full 12 month contribution, and as indicated below, management continues to build off the strong MCA retail network.